If you thought that lures didn’t get any more sophisticated than Rapalas, and have several used tenners that need a good home, a treat awaits you. Chris Sandford’s book is billed as “the first in-depth study of artificial baits made in the British Isles.” Published by the author it might be, but if I ever see a better self-published book than this one, I will be surprised. Comprehensive though it is - as far as the rarer lures are concerned - this volume was never intended to be the definitive history of baits, and although the subject matter is grouped by period, there is little background text. 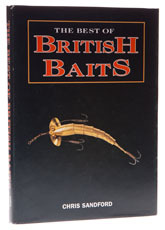 But The Best of British Baits is a remarkably comprehensive treatment of what (until now) has been a Cinderella subject and the book has achieved a well-deserved status as a standard reference work. For your money, you get more than a hundred pages of colour photography, set amongst a parade of patents ranging from the peculiar Turbine Loach to the classic Flexible Jointed Cleopatra. The lavish use of colour makes The Best of British Baits into an excellent reference work on a previously almost inaccessible subject. The title is very appropriate and if you want to read about the most collectible baits of all time, there is no better source. Very enjoyable, and don't miss the supplement, which is an essential reference to bait mounts, flights and harnesses. This book is now marketed by the Medlar Press.